A year ago we were in Venice to experience the 57th Biennale Arte. It was the first time I had been to the Biennale, the ultimate art experience. Having visited Venice years before in the Fall; I was only focused on the Biennale in Venice in 2017. 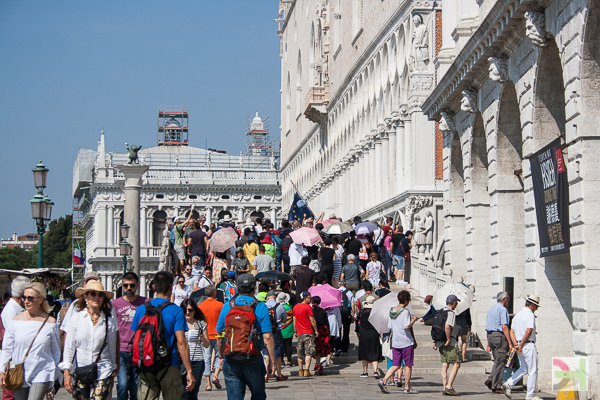 Honestly, the crowds of humanity in flip-flops and short shorts created wide, pushy barriers to our crossing all bridges on the walk to our hotel near Piazza San Marco. The next day, during the beautiful morning walk to the Giardini for the Biennale, we noticed the people going in our same direction were lacking the beach attire but were more of an art museum crowd. TIP: You don’t need to be a serious photographer to be out and about at 5-5:30 AM and enjoying the early Venetian light in Piazza San Marco all to yourself. TIP: Reserve ahead your tickets in advance to iconic places to visit such as, Saint Mark’s Basilica. “In July and August it’s like war,” says Paola Mar, Tourism Chief of Venice. In this interesting article by the Independent, see the link below, you can learn about how day-trippers have impacted your Venice visit. 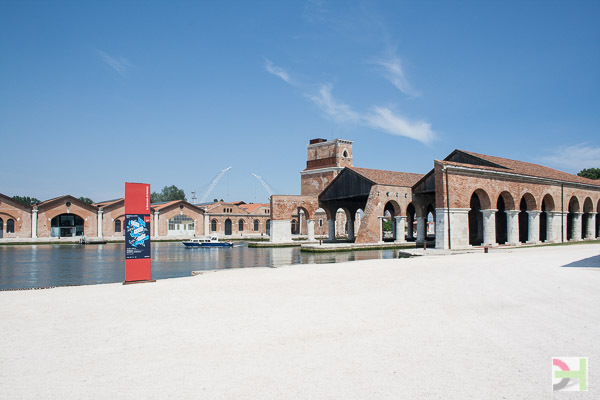 Our second Biennale day was spent at the Arsenale. The Venetian Arsenal (Italian: Arsenale di Venezia) is a complex of former shipyards and armories clustered together. A light breeze and quiet outside the uncrowded exhibition spaces was a welcome respite from the overwhelming crowds between St. Marks and the Venice main train station, Santa Lucia. Forward to the end of May 2018 – Turnstiles were installed at key points of entry to Venice. At this time locals are protesting this approach to limiting day tourist visitors. Visitors are advised that during the period between 1 June and 2 September 2018 , already indicated in the Tourist Bulletin as a period of possible high tourist crowding, the Municipality of Venice may adopt, with the required gradualness, extraordinary measures for the management of visitor flows through pedestrian and / or traffic deviation interventions shared by the Provincial Committee for Public Order and Safety and decided in a timely manner by the Local Police on the basis of the actual level of pressure exerted on the City, in order to guarantee a secure management of tourist flows, consistent with the needs of residents and in terms of order and safety. However, the residents of the municipality of Venice and in general all the holders of the Venezia Unica card are excluded from these operations. Special ordinances may be issued on the occasion of the Feast of the Redeemer on 14 July and the Historical Regatta on 2 September, and in the event of unforeseen emergencies. It is advisable, also in order to avoid possible inconvenience, to visit Venice on days not affected by these extraordinary measures, preferring dates and times when the city is less crowded. This entry was posted in Italy, Travel, Uncategorized and tagged Venice Italy.